These are lyrics by Lamb Of God that we think are kind of nonsensical. 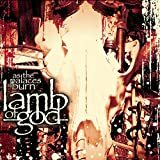 Lamb Of God's, "Break You"
Full of nothing but deprivation. If one is deprived, that would imply one is lacking something, so would be impossible to be full.